Of all Billy Heath’s signings from North Ferriby, perhaps Tom Denton was the most inevitable. The 6ft 5in striker was top-scorer in both seasons he played under Heath at Ferriby and epitomises the Town manager’s powerful and imposing approach that seems to characterise his teams. A string of Conference North centre-backs, including Town’s Scott Garner, who was at Boston for three seasons, can attest to Denton’s physicality and brute force, which is now a useful weapon in Halifax’s armoury. Denton started at Wakefield, where he caught the eye of Huddersfield Town, who he joined on a three-year contract in 2008. 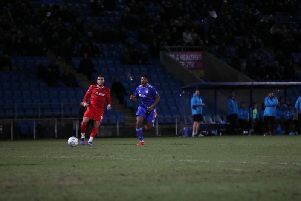 He stayed there for two years without making a first-team appearance and instead had loan spells at Woking, Wakefield and Cheltenham. His nomadic non-league career has also included spells Alfreton, Mossley and a successful two years at Worksop before joining Heath at North Ferriby. On his manager: Denton said: “He’s always drilling things into you, getting you mentally prepared for games. “He’s always demanding hard work and that we work hard for each other, and it works. “As soon as I come into training he always has a word with me and he gets me motivated to go on the pitch and play for him. “I’d flitted around at clubs, having a season here a season there, and then Billy took me under his wing and sorted me out. Denton, who also works as a plasterer, had no doubts about following Heath to Halifax. “It’s a big club and with Billy coming from North Ferriby it was a no-brainer really,” he said. “We had a great relationship between the manager and all the players there. “He got us results so I wanted to carry that on. “The main things are hard-work and togetherness. We did well at home as well. “You’ve got to get the right signings in there to begin with. “He’s probably brought the best bunch of players Ferriby had last season. Heath’s North Ferriby gained a reputation for direct football tailored to the towering Denton, who says there is some justification for that tag. “It can be that way but we had some good footballers as well,” he said. “I think having a mixture of styles is a good way to go about it. “You can get your ball players playing and also get it out wide and put some crosses in. “We’ve got some other big lads in the team. “Even the small strikers like crosses into the box.